We were contacted in mid-March by Steve Anderson who works with the Duo Duo Project, providing assistance and support to activists in China fighting the dog-meat trade. He said that there was a greyhound in China who needed a group willing to take him and if were we interested. Of course, the answer was yes. A female had been rescued from the dog-meat trade and the following day gave birth to four puppies. One puppy was stillborn, two others had found a home and the fourth, a little boy named Pang Pang (pronounced Ping Ping), still needed a home. He had been fostered by a German family in Beijing, but because of strict laws about ownership of large dogs in the city, he needed a place to go. And, as the neighbors had already begun complaining, Pang Pang needed to go soon. Over the course of a couple weeks, we began putting together his flight from China. Leaving Tracks, Inc., a not-for-profit whose mission is to support greyhound rescue and adoption agencies, like American Greyhound, generously offered to raise funds to cover his transportation to America. With the timing, we decided it would work out wonderfully to introduce him at the auction on April 1st, so it was decided to keep his arrival a secret until auction night. He arrived at O’Hare on the afternoon of Friday March 31st. American Greyhound President, Jeff Coggins, along with Laura Anderson, Denise Colletti, Joyce and Michael Altman from Leaving Tracks met little Pang Pang. This resilient little guy popped right out of his shipping crate like the trip had been no sweat at all for him. Because he had exhibited some Houdini-like traits in China, extreme care was taken to assure that he would not escape. Besides a small harness, he also was fitted with two slip leads, one around his neck and another around his waist. It seems that all this extra security was over-kill, as he hasn’t shown any propensity for escape since arrival, but, better safe than sorry. He was introduced the next evening at our 7th annual Winning Hearts Not Races benefit auction, and, as you would expect, it was with tremendous excitement and interest. Everyone, obviously, wanted to get a look at him, pet him and get a photo with him. Pang Pang is currently in foster care in Valparaiso and will be until his neuter is complete. From there, he’ll find his forever home and live a long, healthy life, completely clueless as to what his fate may have been. We have learned a great deal about the dog-meat trade by our association with Pang Pang. First, we were surprised to find that over 2/3 of the population of China is opposed to the consumption of dog-meat. This is a product of much hard work by the activists in China, as well as the changing attitudes of younger generations of Chinese. Now, dog-meat is primarily consumed in the rural areas as well as the areas near the borders with Korea and Vietnam (countries where dog-meat consumption is much more prolific). The activists in China are doing the primary work of interdicting dog haulers and confiscating the dogs carried by them. Due to current Chinese laws, westerners are prohibited from these undertakings. There are some organizations in the United States who do work to support the Chinese activists (Duo Duo Project, ACTAsia, and Animals Asia). You can learn more about them on their websites. Before supporting any group claiming to be working to end the dog-meat trade in Asia, you are urged to contact Steve Anderson at sjalar@sbcglobal.net, as there are, as you can imagine, numerous unsavory, scam organizations who are only looking to pocket your dollars. 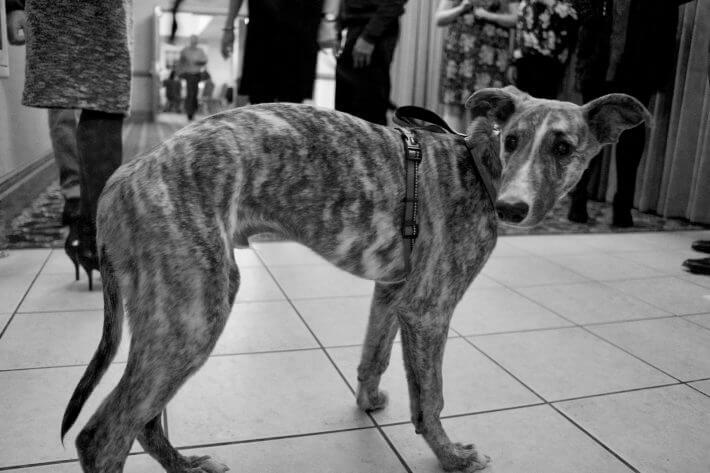 American Greyhound won’t even be able to make a dent in the dog-meat trade, but what we can do is raise awareness of what’s going on and provide support (like taking in Pang Pang) to those groups in China that are making a difference. Just like we have done in the past with the Galgos we took in from Spain a couple years ago, we’re providing a landing spot for a sight hound in need. And, maybe providing a little education to our American Greyhound family along the way.